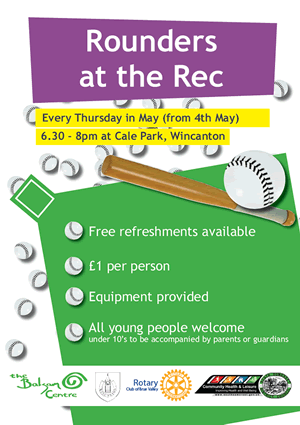 Show up at Cale Park with a quid this Thursday 4th May at 6:30pm to hit a ball with a stick and run around in circles and stuff. It'll cost the quid to take part, but refreshments will be free and the equipment will be provided. All young people are welcome, but under 10s will need to be accompanied by an adult. There will be a core of adult supervision, including a qualified coach from King Arthur's School. But this is just the start of something long overdue in Wincanton. We're lucky enough to have a well equipped sports centre, a versatile sports ground, a multi-use games area (MUGA), a skate park and now a newly refurbished play park. But these facilities alone aren't always enough to reach and engage young people in and around the town. Without a bit of communication and organisation it can be very difficult for individuals to take advantage of all the town's amenities. Youths all to often struggle to find something to do during the summer, between terms and in the evenings, perhaps because organised fun usually requires paying for membership and making committments. A group of volunteers, currently without an interesting name, has been meeting at the Balsam Centre in an attempt to solve this problem by setting up some informal organised activities this summer. Their goal is to reach out to young people to encourage them to get involved, and hopefully get feedback on what they'd like to do next. With a simple, low-budget, grass roots beginning they hope to establish a core of interested youths who will support more ambitious projects in the future. There's a great deal of inspiration to be found in the success stories of youth ventures in other areas. While these beginnings are modest indeed, the potential is great. The group is supported by Wincanton Town Council, South Somerset District Council and several local groups and individuals in the area including the Brue Valley Rotary Club and the Balsam Centre itself. With potential sources of funding yet to be tapped, they are considering ways they might be able to establish a base of youth operations. Perhaps an indoor space young people could call their own in the way they've done with youth clubs in the distant past, and a means by which the group could continue into the darker, colder winter evenings. To get the ball rolling there will be Rounders at the Rec every Thursday in May, 6:30pm till 8:00pm, starting this week. If it goes well and people turn up it may continue through the summer, but the group is keen to find out what else the young people would like to do, when and where. If ball games at the park isn't to your taste, turn up anyway and tell the organisers what you'd like to do instead. Rounders at the Rec really is just the beginning.